Hunger on campus – it’s not what immediately comes to mind when people think about the college experience. And yet, since the 2007 recession, college students have increasingly reported having trouble being able to afford some of the most basic necessities. In Dona Ana county, the poverty rate is 27.9% (U.S. Census Bureau, 2016), nearly twice the national average. New Mexico residents make up the vast majority of NMSU students, with about half of those coming from Dona Ana County, and ever increasing numbers of students report working while in school and needing to provide for their families. We want to make sure that no Aggie student NMSU has to decide between staying in school and having enough food to eat. 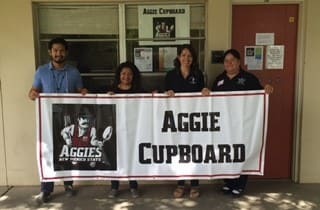 The Aggie Cupboard provides food assistance to NMSU and DACC students and employees. When you donate, we’ll provide nonperishable food assistance that can be accessed by those in our local NMSU community up to every week. Join us as we help fuel student success!